A number of schools are considering firing their longtime successful coaches, in the hopes of getting a more successful one. Should they do so? An analysis of previous cases shows that axing your successful coach is about as smart as going for it on fourth-on-long, deep in your own territory. Driving around West Georgia, I often listen to 92.9 FM "The Game," Atlanta Sports Radio. 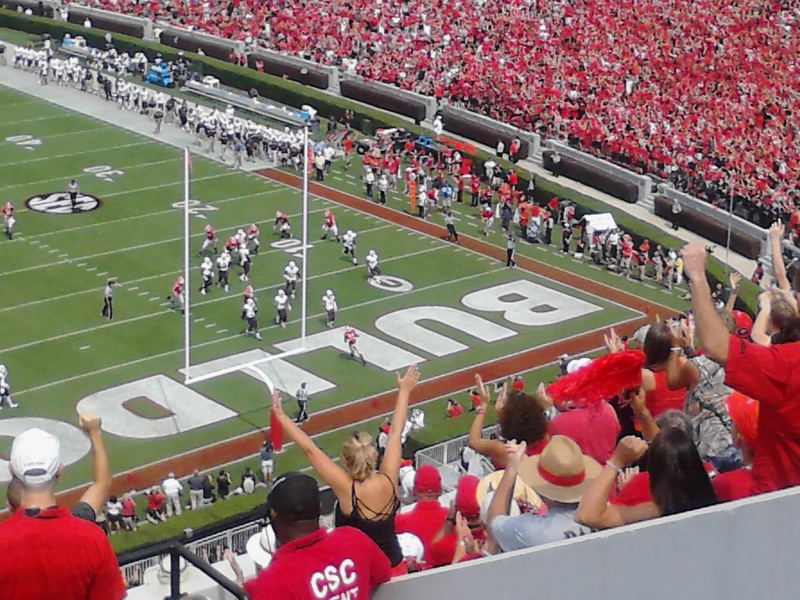 There, the announcers have been demanding that University of Georgia Bulldogs Coach Mark Richt be fired. The Louisiana State University Tigers are considering dumping Coach Les Miles. What's interesting is that Richt has won 73 percent of his games, while Miles prevailed in 75 percent of the games he coached in for LSU. Yet fans believe that a coaching change will get their team back to the National Championship much more quickly than if they stayed with the tried and true veteran. 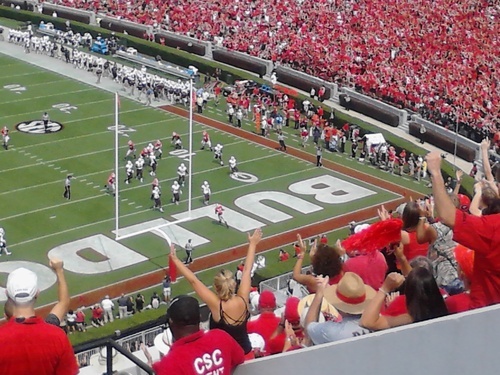 Photo taken by the author during the University of Georgia's season opening game in Athens, Georgia. Rather than go with what several of these sports pundits do, and simply assume the new coach will do better, I look at several cases where a longtime coach who won more than two-thirds of his games was fired or forced into resigning, in recent years. And here are the results. Longtime loyal Nebraska assistant Frank Solich won 75 percent of games himself, and even took his team to a National Championship game. But he was fired in favor of former Oakland Raiders Coach Bill Callahan, who had a much lower winning percentage (55 percent), and a pair of losing seasons, two of only four in the previous 46 years of Nebraska football. The end was ugly. Callahan's replacement, Bo Pelini, coached Nebraska to 9 or 10 win seasons every year. But then he was fired in favor of Mike Riley, who coached the Cornhuskers to a losing record in his first year with him. Down in Texas, Mack Brown prevailed in nearly 77 percent of his games, winning a National Championship and getting to another National Championship Game. But he was forced to step down. Replacement Coach Charlie Strong has won only 43.5 percent of his games at Texas. In-state rival did the same, pushing out longtime loyal coach R. C. Slocum, who won 70 percent of his games. Replacements Dennis Franchione and Mike Sherman were far less successful in following Slocum's record, brining shame to the school. Only now with Kevin Sumlin, a decade later, is there hope of a coach who could win as many games as Slocum. In the SEC, Tennessee decided to oust Coach Phil Fulmer, despite getting the team their first National Championship and winning 78 percent of their games. Replacement Lane Kiffin was a national embarrassment, while Derek Dooley was hapless, winning only 43.8 percent of his games. Current Coach Butch Jones is better than Dooley, but has won 52.8 percent of his games with Tennessee. Then there's Lloyd Carr, who also won a National Championship for Michigan, who was hounded into calling it quits after losing to Appalachian State (in a season where his team sill won the Citrus Bowl, beating Tim Tebow and the Florida Gators). Replacements Rich Rodriguez and Brady Hoke never came close to Carr's 75 percent wins pct. for the Wolverines. Even lesser known schools remove successful coaches in favor of the latest flavor to disastrous results. Maryland got rid of Ralph Friedgen after he won 60 percent of his games, and went 8-4 his last year, so they could get Randy Edsall. Edsall lived up to his name as the doomed Ford car, going 22-33 over five seasons. He was fired this season. Supporters of making a switch point to Nick Saban and Urban Meyer. Yet these coaches replaced Mike Shula (26-23) and Ron Zook (23-14) who both coached only a short time, without much success. They are hardly in the same league as Richt and Miles. The 92.9 FM radio station lists Florida's Jim McElwain as the model for a team that fired a mediocre coach, thanks to his fast start in his first season. But they forget that at one point, Will Muschamp was seen as the new star, for the fast start for his Florida Gators. His Gator tenure ended in disaster. Such sports pundits said the same thing for Auburn coaches Gene Chizik (fired after a disastrous season not long after a National Championship) and Gus Mahlzahn (who took a team to the National Championship Game two years ago, but needed to beat Jacksonville State, San Jose State and Idaho just to salvage a possible .500 record). Florida State University Coach Jimbo Fisher might fit the mold of improvement (winning .825 and a National Championship) over a longtime successful coach, and that's only if you assumed Bowden was secretly fired, instead of retiring. Fisher was also Bowden's assistant, and not some outsider. Only Jim Tressel at Ohio State University followed a coach (John Cooper) who was fired after winning 70 percent of his games, won a National Championship. But Tressel, after taking the team to several other National Championship Games, led the program into scandal and had to be replaced as well. If you want to win that National Championship, you're better off sticking with that longtime successful coach, riding out the three loss seasons. Think of how many times Bobby Bowden, Tom Osborne, Joe Paterno, LaVell Edwards, Don James and even Brown, came close to winning before the big breakthrough. Oh, and by the way, want to know what Coach Nick Saban's winning percentage is? It's .761, only a hair above Richt and Miles. Perhaps both Georgia and LSU should consider that, and the other cases of woe, before removing what works in favor of what might work.